There was a long tradition of men from County Longford serving in the British army. Undoubtedly, the fact that Longford was a garrison town contributed to this. The town had two barracks. The one for cavalry was established in 1774 around the old castle in an area adjoining Church Street and Battery Road. The artillery barracks at Lisbrack dated from c. 1810. ￼The county was within the recruiting area of the Leinster Regiment and it ￼seems that most of those who joined-up locally served in that regiment. Some Longford-born soldiers enlisted in Britain and others in Dominions such as Canada and Australia. There were also Longford men in the U.S. army. There were Longford women who served as nurses in various places and their contribution to the war effort must be properly acknowledged. It has been estimated that over 2,500 men served in the British forces in the First World War. It is hoped that further research will establish the actual number. Recruitment was higher in the towns and Longford town had the highest level of anywhere in the county. In December 1916, Fr Donohoe C.C. found, while taking a census of Templemichael parish, that forty men from Chapel Lane (with forty houses) had enlisted. Ten of them had been killed and another eighteen wounded. In January of that year, it was reported that ninety men had gone to war from Edgeworthstown. There were several fundraising efforts in the county throughout the war. In 1914, there was a collection to purchase an ambulance for the front, which raised £600. Some of the initiatives in 1915 were aimed at sending parcels to the men of the 5th battalion of the Royal Irish Regiment, serving in Gallipoli, and commanded by Lord Granard. Ladies’ Recruiting Committees were set up in 1916 and members joined recruiting officers on their rounds. The Soldiers and Sailors Help Society was established in Longford in 1918. There was also extensive fundraising for the Red Cross. A fête and dance at Castleforbes on 15 August 1918 realised £707 for it. Thomas joined the Connaught Rangers on 2 January 1912 and served until 15 July 1915. He was discharged due to injuries received in the war. In October 1918, he enlisted in the Royal Air Force at Middlesbrough and in November 1919, he re-enlisted in the Connaught Rangers. Soon after the war, he was posted to India. 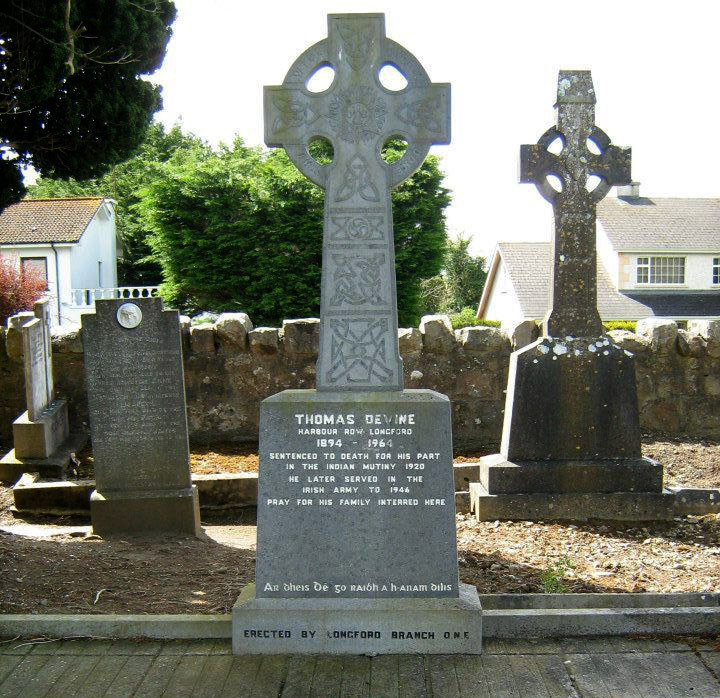 On 28 June 1920, while stationed at Jullundur in the Punjab, Thomas took part in a mutiny which was a protest against the conduct of the Auxiliaries and the Black and Tans in Ireland. He was one of the men who was sentenced to death for involvement in the incident, though the sentence was commuted to life imprisonment. 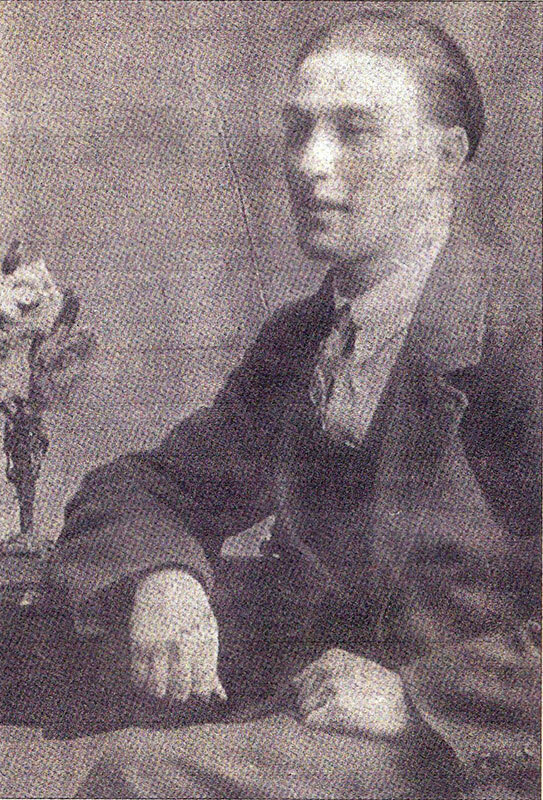 James Daly from Tyrrellspass Co. Westmeath was the only participant to be executed. Thomas was released after two and a half years and returned to Longford. He later served in Eoin O’Duffy’s brigade in the Spanish Civil War and in the Irish army during the Second World War. He died at Harbour Row, Longford in 1964. Today his grave in Ballymacormack Cemetery is looked after by the Peter Keenan Branch O.N.E.T Longford. Thomas, son of Patrick Leavy and Kate McDonald, was born at Noud’s Yard Longford. He enlisted in Longford on 14 August 1902 and served in the army for seven years. Afterwards, he transferred to the reserve and was employed as a coppersmith’s mate at the dockyard in Devonport. He was called-up on the outbreak of war in August, 1914 and served in the 2nd battalion of the Leinster Regiment. Three of his brothers also served in the war and one of them, James, was also in the Leinsters. Thomas saw action in France and Flanders from February 1915. He attained the rank of sergeant and was awarded the Distinguished Conduct Medal and the Croix de Guerre for conspicuous bravery in the field. 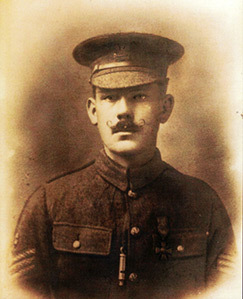 Michael joined the Connaught Rangers in 1914 and served throughout the Great War. He was shot in 1915 at Neuve Chapelle, Belgium and the bullet lodged in his heart. He was unconscious for a week, but an x-ray failed to locate the bullet and eventually Michael was sent back to the front line. He took part in the Battle of the Somme in 1916 and was again wounded, this time by shrapnel in the thigh. The wound meant further hospitalisation, but again, the bullet in his heart was not discovered. Unable to continue in armed combat he was transferred to the Labour Corps and after the war he returned to Longford. Michael suffered from heart problems and in 1925 Dr Mary Farrell sent him to the Richmond Hospital in Dublin where he was again x-rayed. This time, ten years after he was shot, the bullet was discovered. He was transferred to Queen Mary’s Hospital in Roehampton where it was removed during a major operation. Naturally, Michael’s remarkable story attracted international attention. A month later he was sufficiently recovered to attend a garden party at Buckingham Palace. He died at his home in Legion Terrace, Longford in 1944. Today, members of his family are the proud owners of the bullet, a souvenir of one man’s extraordinary story. Born at Currygrane, Ballinalee, Wilson joined the Royal Longford Militia in 1882 and later served in Burma and in South Africa during the Boer War (1899-1902). At the beginning of the Great War, he was a liaison officer dealing with the French army. He was promoted to the rank of lieutenant- general in 1915 and commanded the IV Corps in France for most of 1916. Late in the following year, he was appointed to the Eastern Command. 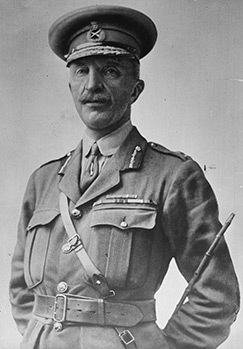 In 1918, he became chief of the imperial general staff, which meant that he was the commander of the entire British army. After the war, he attained the rank of field marshal and was created a baronet. Wilson was M.P. for North Down and a military adviser to Sir James Craig, the first prime minister of Northern Ireland. He was assassinated by the I.R.A. in London on 22 June 1922.